The Statue of Liberty Enlightening the World. 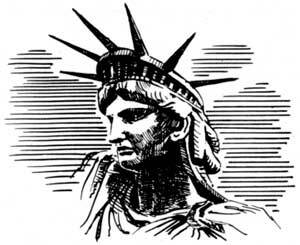 THE STATUE OF LIBERTY ENLIGHTENING THE WORLD was conceived and designed as a symbol of a great international friendship. With the passing of the years its significance has deepened until today it is the most symbolic structure in the United States. Standing in New York Harbor at the very portal of the New World, the Statue of Liberty, one of the most colossal sculptures in the history of the world, has greeted many millions of the oppressed and of the venturesome of other lands who have crossed the ocean in hopeful search of greater freedom and opportunity. To them, and to the whole world, the statue has become the symbol of those ideals of human liberty upon which our Nation and its form of government were founded. In its international aspect the statue, which was a gift from the people of France to the people of the United States, commemorates the long friendship between the peoples of the two Nationsa friendship that has continued since the American Revolution when, implemented by the French with sinews of war, it helped turn the tide of victory to the side of the Colonies. Then there is symbolism in the design of the statue itself. The broken shackles of tyranny that are molded at the feet of Liberty spoke for themselves to generations of people fleeing tyranny. The tablet in the statue's left hand, inscribed July 4, 1776, refers to the Declaration of Independencetelling all comers of the American ideal that "all men are created equal." 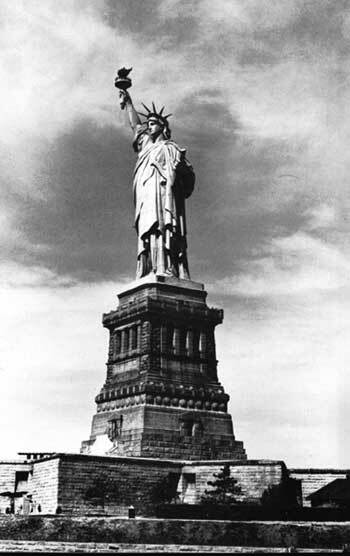 The torch, held high in her right hand, hardly needs explanation as she lights the way to freedom and liberty. Speaking at the fiftieth anniversary celebration of the unveiling of the Statue of Liberty in 1936, President Franklin D. Roosevelt said: "Millions of men and women . . . adopted this homeland because in this land they found a home in which the things they most desired could be theirsfreedom of opportunity, freedom of thought, freedom to worship God. Here they found life because here there was freedom to live. It is the memory of all these eager, seeking millions that makes this one of America's places of great romance. . . . It is fitting, therefore, that this should be a service of rededication to the liberty and the peace which this statue symbolizes. Liberty and peace are living things. In each generationif they are to be maintainedthey must be guarded and vitalized anew."